FIRST AID: When disaster strikes, minor injuries can quickly become major problems. Our disaster preparedness kit comes equipped with a 85-piece first aid kit, glowsticks, 5-1 emergency whistle, work gloves and masks so you can keep you and your family safe. SHELTER: When displaced by an emergency, you need the right tools to keep your family safe and sheltered. Our disaster preparedness kits include ponchos, blankets, a flashlight and a multi function utility knife. Our 4-Person premium survival kit for disasters and emergency preparedness (#1 seller) contains enough food, water and emergency supplies to last a family of 4 for 72 hours. Always ships for Free. Food and water are U.S. Coast Guard certified, contains a hard-shell Lifeline First Aid kit (LF4408) 4408) and LifeGear LED Flashlight. Over 245 pieces that meet or exceed Red Cross guidelines for preparedness. 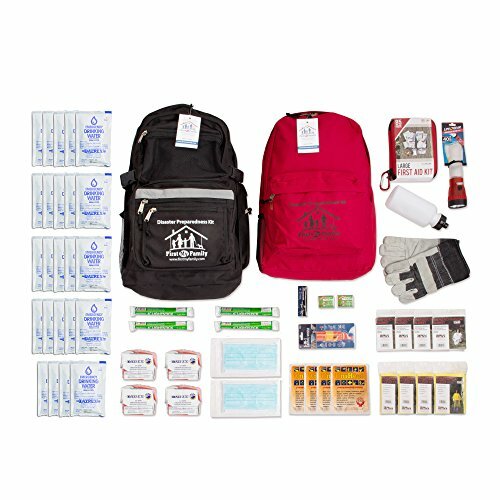 Ideal survival kit backpacks for families, couples, individuals and great for students in college and far from home.